With COLORFUL, objects will change color completely, so you can hand them out for anyone to check, without a trace. VISUAL - DIRECT - EYE CANDY! If you spend most of your time performing magic with cards or coins, why not spend a little on magic with everyday objects? Just a little... with COLORFUL. Bottle caps are found everywhere, in many colors, so why not perform a little bit with them? We are proud to present this product, an all-new gimmick that has never appeared before. Use it to change the color of bottle caps, not once but several times! Whether on a table, plastic bottle, or anywhere, simply grab one and change it immediately. 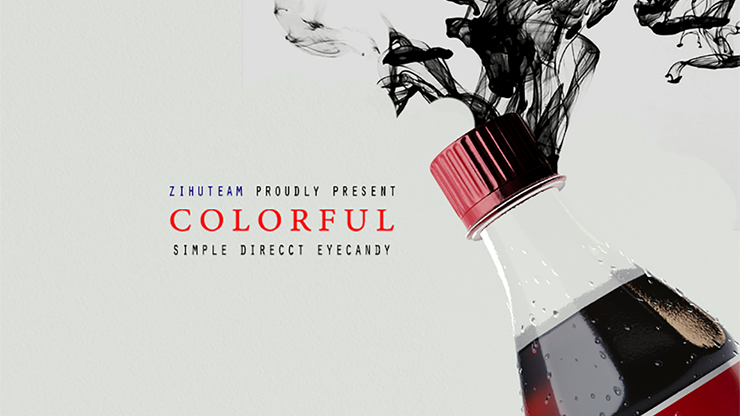 - The cap color change can happen while on the bottle, inside one's hand, or in mid air! - Can perform in any environment or situation: in your hands, while on the bottle, while in the air, and even in the spectator's hands! - Many routines are taught: transposition, color changing effects, and more.